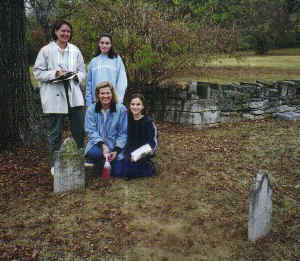 In November of 1999, twelve Colonial Dames volunteers launched the Davidson County Cemetery Survey project. Since that date, 375 community volunteers have been involved in visiting cemeteries, photographing tombstones and recording inscriptions. Another 250 volunteers have provided local history, family data, cemetery directions or archaeological assistance. To date, 605 cemeteries are listed in the Survey project. Categories of cemeteries include family graveyards, benevolent society burial grounds and churchyards. Some cemeteries have been “Lost” or “Destroyed” or “Removed” from their original locations. All tombstone inscriptions are posted on the website. Copies of the inscriptions, sketches of graveyard layouts and directions to surveyed cemeteries have been placed in the Metro Archives collection. For those cemeteries, characterized as “Lost” or “Destroyed” or “Removed,” research reports including the names of those once buried in these graveyards, if known, are listed on the web site. The locations of all surveyed graveyards, as reported to the Metro Planning Commission, have been pinpointed on county survey maps and thus are better protected from encroachment. Kimberly Batts designed the original website and served as web master from 2000 to 2011. Scott Smith of Atiba Software stepped forward, in 2012, to reconfigure and update the web site using Google Sites. This upgrade was completed in October 2012. Many cemeteries are located on private property. To protect privacy, the exact locations of cemeteries are not been given on the web site. If you are a descendant and wish to visit your family cemetery, please contact Metro Archives (615 862-5880) for directions. The Tennessee State Law Protection of Cemeteries is available to read on the website. Every year “new” cemeteries are reported to the Cemetery Survey project. These cemeteries are reported by descendants, neighbors or survey volunteers. If you have information about a “new” cemetery or additional names of persons buried in the family graveyards, please click HERE to report the cemetery to us. For information and tips on basic cemetery care, please see the Metro Historical Commission's Caring for Davidson County's Cemeteries brochure.